We operated our first atomic force microscope at the University of Rostock. This was funded by the Federal State of Mecklenburg-Western Pomerania, and we are very grateful for this support! Several undergraduate research projects have been conducted using this equipment, resulting in publications. SUNY Albany, however, provides even better AFM instrumentation. The microscope in Rostock was a Nomad SPM from Quesant (USA), with an active vibration damping platform. We use the AFM to study the surface of our heated electrodes in the nano scale. Here is, e.g, a topographic image of a sputtered gold film on a ceramic substrate. 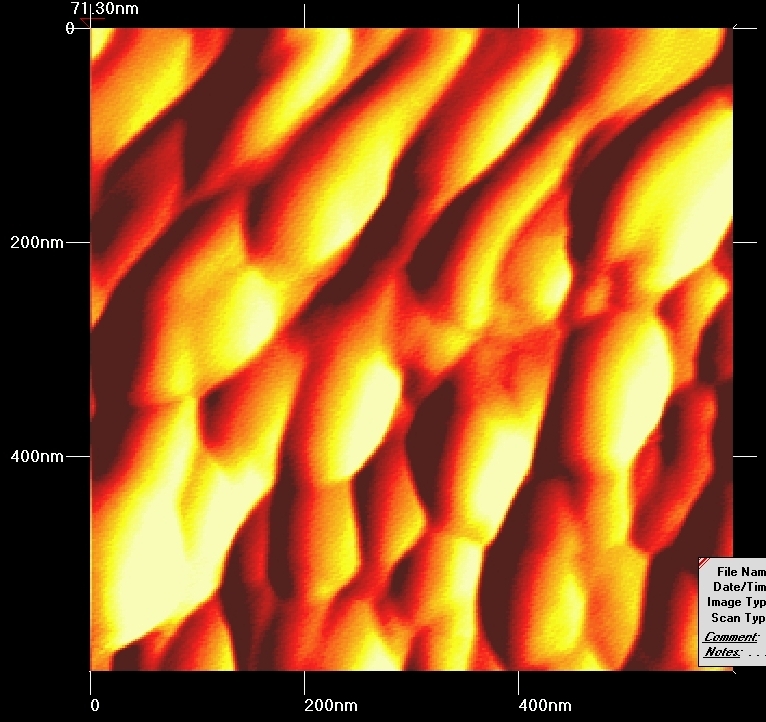 The following figure depicts AFM images of a gold LTCC electrode (low temperature cofired ceramics, above). Two images of a sputtered gold layer before and after annealing at 600 °C are displayed below.